On a rainy February night, Sam is killed in a horrific car crash. But instead of seeing a tunnel of light, she wakes up in her own bed, on the morning of the same day. 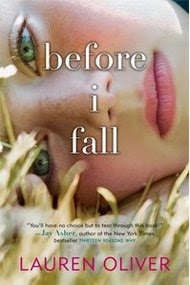 Forced to live through the same events – the drive to school, skipping class, the fateful party – she struggles to alter the outcome, but wakes up again on the day of the crash. What follows is the story of a girl who comes of age in a matter of days. Who discovers, through heartbreaking insights, the consequences of her every action. Of a girl who dies young, but in the process learns how to live. And who falls in love . . . a little too late. I'm really looking forward to this one too, it sounds amazing! That sounds great. I want to read that too! And yesss, BIF seems great!! And the cover is... perfect ^3^!